When most people think of crabs they probably think of a very large animal that comes from the ocean. Some people might also be familiar with smaller crabs, including the soft-shelled ones. Well, I was pretty surprised when I found out that these crabs don’t even come from anywhere near the sea. They are actually very commonly found in the rice fields all over Thailand. These ones were simply hand caught by digging through the mud. There are many different preparations for them including putting them in somtom (with the infamous fermented fish, bplaa raa [ปลาร้า]). 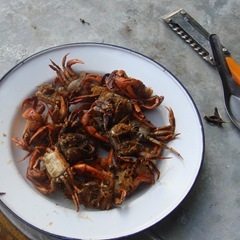 Pictured here is a simple plate of fried crabs (bpuu tawt [ปูทอด]). This entry was posted in food, southeast asia, thailand and tagged food, isaan, seafood, southeast asia, thailand. Bookmark the permalink. Post a comment or leave a trackback: Trackback URL.